Because Caspase-8 activation is such an early step in the extrinsic apoptosis pathway, measurement of Caspase-8 is an interesting alternative to measurement of apoptosis via Annexin V-FITC / PI, which involves binding to phosphatidylserine (PS) on the surface of apoptotic cells. The translocation of PS to the surface of the cell membrane occurs downstream in the apoptotic process and identifies cells committed to death through either the extrinsic or intrinsic apoptosis pathways following activation of Caspase-32. The CaspGLOW™Fluorescein Active Caspase-8 Staining Kit offers a simple, sensitive method for detection of active Caspase-8 in living cells. When detecting caspase-8, we utilize a specific FITC-conjugated caspase-8 inhibitor, IETD-FMK. IETD-FMK is cell-permeable and binds irreversibly to active caspase-8 within the cell. The fluorescent marker (FITC) on the IETD-FMK allows for the detection of cells undergoing apoptosis via Caspase-8 activation using the Vision CBA Analysis System. 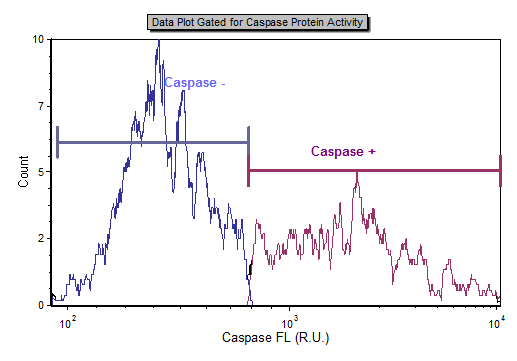 Caspase-8 activity is presented as a population percentage and caspase-positive cell concentration. 1) Hengartner, M.O. (2000). The Biochemistry of Apoptosis. Nature, 407(6805), 770-776. 2) Taylor RC, et al. (2008). Apoptosis: Controlled Demolition at the Cellular Level. Nature Reviews Molecular Cell Biology, 9 (3): 231-241. 3) Fulda, S., et al. (2006). Extrinsic Versus Instrinsic Apoptosis Pathways in Anticancer Chemotherapy. Oncogene, 25, 4798-4811. 4) Spencer. S.L., et al. (2011). Measuring and Modeling Apoptosis in Single Cells. Cell. 144, 926-939. 5) Naoghare, P.K., et al. (2009). Simultaneous Quantitative Monitoring of Drug-induced Caspase Cascade Pathways in Carcinoma Cells. Integrative Biology. 2, 46-57. 6) Fulda, Simone (2011). Targeting Apoptosis Signaling in Pancreatic Cancer. Cancers. 3, 241-251.